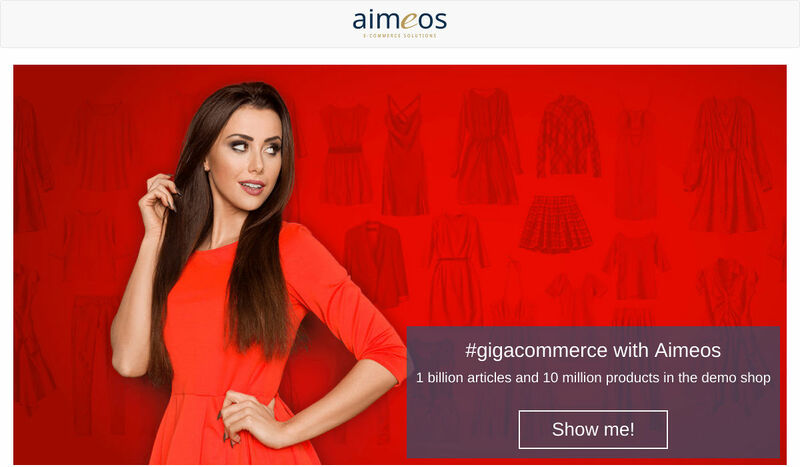 Aimeos has recently proven to be capable of handling one billion articles and more in an online shop using the #gigacommerce extension. This is far more than the number of articles at the Amazon market place which is currently estimated by around 562 million items. But the sheer numbers doesn’t say anything about the performance so how fast can Aimeos delivery content when users browsing the shop pages? 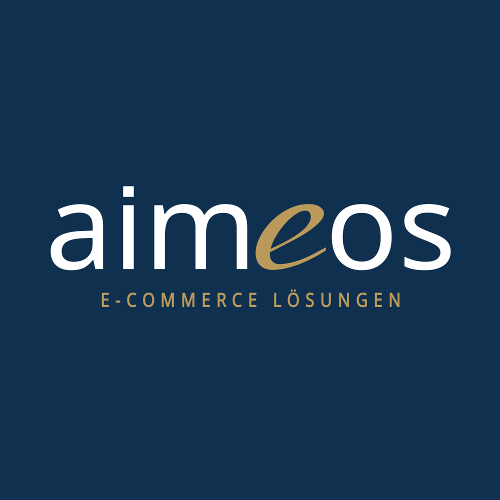 For a realistic test Aimeos has been set up in a standard cloud hosting environent sponsored by Profihost, an e-commerce hoster from Hannover, Germany. They provided two of their “Flexserver Expert” packages, which are virtual machines running on a cluster with Intel Xeon Skylake 2,6 GHz CPUs. The response time therefore consists of the network latency (32ms), the processing on the server (50.7ms – 32ms = 18.7ms) and the transmission time of the HTML page (18.3ms). The network latency is the largest influencing factor here and can be reduced only with difficulty in real operation. In general it is lower the closer the server is geographically to the customer and the better the connection of the hoster is. The Aimeos list and detail page were tested, both with cache and without. The cache does NOT contain the complete page (“full page cache”) as in other shop systems, but only page fragments such as the product list or the product details. The page frame is provided by Laravel, Symfony and TYPO3, in which the fragments are inserted before delivering the page to the client. The tests showed that Laravel 5.7 and Symfony 4.1 are about the same speed. In the evaluations of Loader.io, there were no significant differences between the two and therefore the results were summarized. The only measurable difference is about 5ms, which Symfony 4.1 can generate on an unloaded system faster than Laravel 5.7. Under load there is no more difference. With TYPO3 as frontend, the server can process fewer requests per second, but TYPO3 is not directly comparable to Laravel/Symfony. As a complete content management system, TYPO3 allows the maintenance of pages by editors, which is not easily possible with Laravel/Symfony. 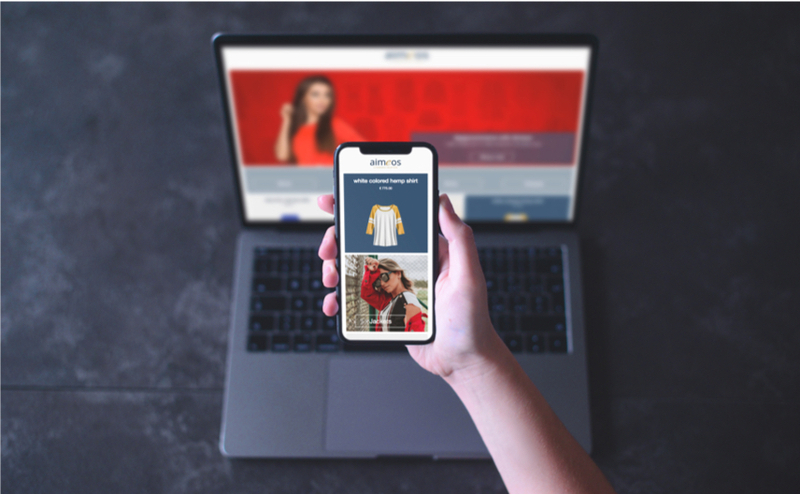 With over 600 PI/second and a processing time on the server less than 20ms, the Aimeos E-Commerce System is certainly one of the fastest shop systems. The differences between list and detail view are mainly due to the different page size (189KB to 66KB) and the resulting longer time for data transfer. Competitors can only achieve similar results by storing complete pages in a Varnish cache and loading shopping carts and other dynamic content through AJAX queries. However, Aimeos is so fast that this would make response times even worse, because the separate query for e.g. the shopping cart is not necessary at all with Aimeos. Even without cache the number of 130-150 PI/second and the response times of 162ms incl. network latency (130ms without latency) are excellent values compared to other shop systems, especially since the system can scale up to 1 billion and more items. This makes Aimeos particularly suitable for high-load scenarios such as TV advertising. Does an online shop with 1 billion items work on a standard cloud server? And that even with the demand for very low response times? We investigated this question during the #gigacommerce project. The #gigacommerce setup contains 1 billion articles, which are combined into 10 million products. Each item contains attributes, images, prices and text like in any online store. The basis is a Symfony, Laravel and TYPO3 installation with the Aimeos E-Commerce extension, which access an ElasticSearch server. All three frontends have been extensively tested to find out where the limits are. The Aimeos components showed that they scale almost infinitely, with response times of around 100 milliseconds. Interestingly, the only absolute limit in the tests was not the available hardware, but the network bandwidth, which was used up at over 600 PI/second. This makes it particularly interesting for peak load situations and TV advertising. The special feature of the Aimeos e-commerce system is its high flexibility. Data can be stored in different backends, which use the appropriate technology depending on the requirements – like here ElasticSearch for the product data. This makes the system ultra fast and scalable. Nevertheless, Aimeos is not a special solution, but comparable with other major players in the industry. The open source software Aimeos can be adapted to the most diverse needs, in particular to complex B2B requirements and delivers everything that is important for an online shop: product catalogs, shopping baskets, payment integration, order management, e-mails and all optimized for mobile devices. Aimeos is available for TYPO3, Laravel, Symfony, SlimPHP and Flow/Neos but the software can be integrated into any PHP application. The term e-commerce framework is related to software frameworks for e-commerce applications. They offer an environment for building e-commerce applications quickly. E-Commerce frameworks are flexible enough to adapt them to your specific requirements. As result, they are suitable for building virtually all kinds of online shops and e-commerce related (web) applications. They provide an overall structure for e-commerce related applications. Furthermore, they implement the general program flow e.g. how the checkout process works. Contrary to monolithic shop systems, existing program flow can not only be extended but completely changed according to your needs. Since the beginning of (internet) e-commerce around 1995, a lot has changed on the technology side. The first generation of e-commerce systems evolved from existing ERP and related systems. This was followed by the 2. generation of standalone shop systems between 2004 and 2008. E-commerce frameworks are the latest generation of e-commerce systems and started around 2012. Hybris, the shop system owned by SAP is one of the representatives of the 1. generation. It’s strongly connected to the SAP ERP system and Hybris is mainly a shop front-end for SAP. Customer relationship (CRM) and content management (CMS) tools are available in the ERP system but very limited. The Magento shop system represents the 2. generation of standalone e-commerce systems. They usually contain CRM and CMS and some other functionality but also only at a very basic level. They might be enough for the smallest shops but are unusable for shop owners who run for real profits. 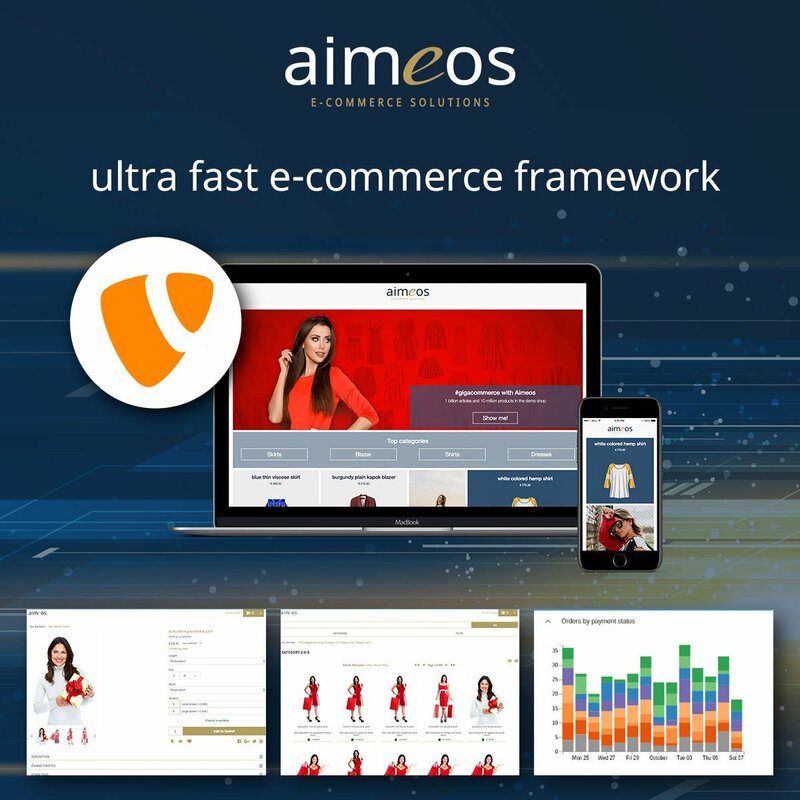 Aimeos is one of the few real e-commerce frameworks that are currently available. These 3rd generation systems excel in their own domain: Present and sell products. For all other e-commerce related tasks, they connect to specialized systems and exchange data in both ways. Thus, shop owners can choose the best systems for their needs. A “design pattern” is re-usable solution that solves similar software design problems in an elegant way. They require programming language templates which enforce public class methods and their signatures called “interfaces”. The basic requirement are independent, side-effect free components that form the building blocks. 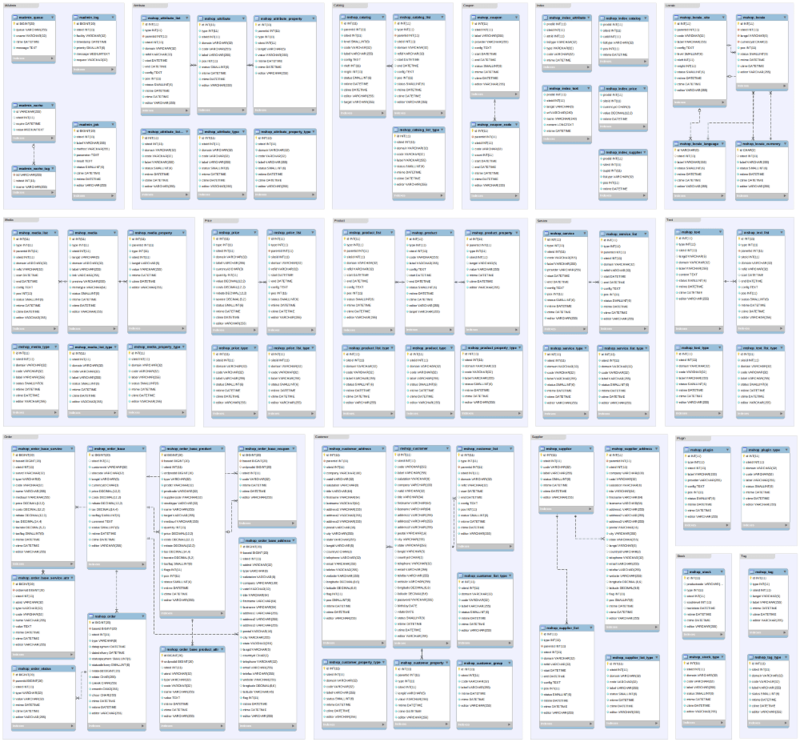 One or more components care about the functionality of a business “domain”. Such a domain can be the HTML front-end, a JSON REST API and the administration interface. 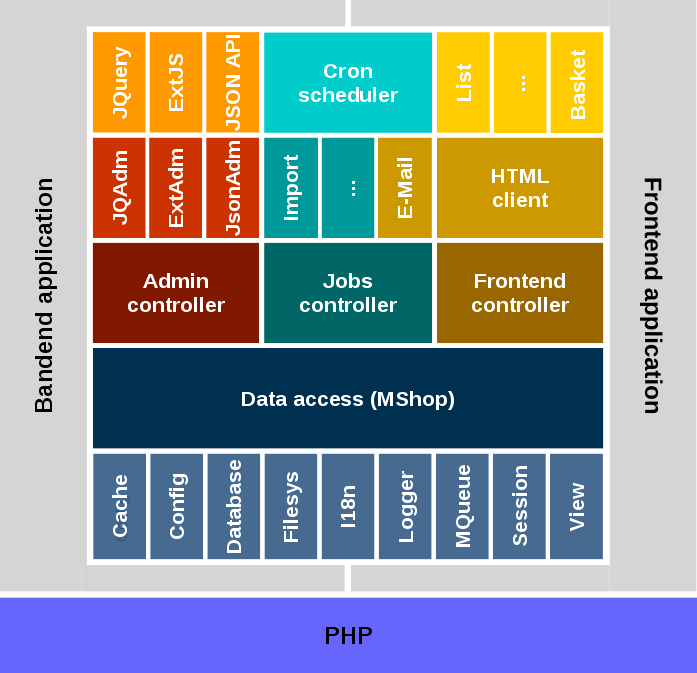 The vertical separation of code into business domains enables scaling out applications by deploying the application as a bunch of micro services. Micro services are loosely coupled applications that offer their service over lightweight protocols like HTTP and JSON. They are easier to extend, maintain and especially deploy than monolithic applications. Der Term E-Commerce Framework bezieht sich auf Software-Frameworks für E-Commerce Applikationen. Sie ermöglichen es in relativ kurzer Zeit komplette E-Commerce Applikationen zu bauen. E-Commerce Frameworks sind flexibel genug um sie an kundenspezifische Anforderungen anzupassen. Dadurch können sie als Basis für praktisch alle Arten von Onlineshops und E-Commerce bezogene (Web-)Applikationen dienen. Sie bieten eine komplette Infrastruktur für E-Commerce bezogene Applikationen. Weiterhin implementieren sie den allgemeinen Programmfluss, z.B. wie der Checkout-Prozess funktioniert. Im Gegensatz zu monolithischen Shopsystemen kann der bestehende Programmfluss nicht nur erweitert werden, sondern auch komplett für die eigenen Bedürfnisse geändert werden. Seit dem Beginn des E-Commerce im Internet um 1995 hat sich vieles auf Seiten der Technologie verändert. Die erste Generation von E-Commerce Systemen entwickelte sich aus existierenden Warenwirtschaftsprogrammen und ähnlichen Systemen. Daraufhin folgte die zweite Generation von eigenständigen Shopsystemen zwischen 2004 und 2008. E-Commerce Frameworks sind die neuste Generation von E-Commerce Systemen und begannen ab 2012 auf den Markt zu kommen. Hybris, das Shopsystem von SAP ist einer der Vertreter der ersten Generation. Es ist eng mit dem SAP ERP System verzahnt und Hybris ist hauptsächlich eine Shopoberfläche für SAP. Customer Relationship (CRM) und Content Management (CMS) Werkzeuge sind im Umfeld von SAP verfügbar aber mit eingeschränkter Funktionalität im Gegensatz zu spezialisierten Systemen. Das Magento Shopsystem repräsentiert die zweite Generation von eigenständigen E-Commerce Systemen. Sie beinhalten CRM und CMS Komponenten sowie ein paar weitere Funktionalitäten, aber ebenfalls nur mit einem beschränkten Funktionsumfang. Sie können für Kleinstunternehmen ausreichend sein, für Shopsbetreiber mit größeren Umsätzen aber meistens unbrauchbar. 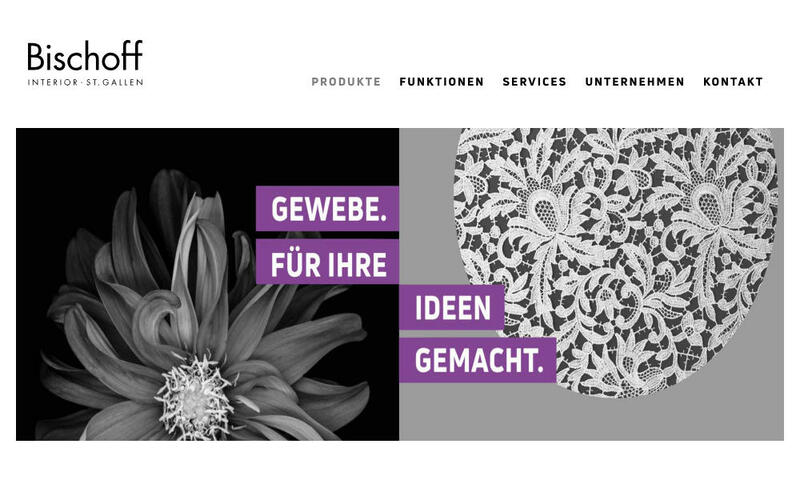 Aimeos ist eines der wenigen echten E-Commerce Frameworks die im Moment verfügbar sind. Diese Systeme der dritten Generation glänzen in ihrer Kerndomäne: Der Präsentation und dem Verkauf der Produkte. Für alle weiteren E-Commerce bezogenen Aufgaben verbinden sie sich mit spezialisierten Systemen und tauschen Daten in beide Richtungen aus. Dadurch können Shopbetreiber das jeweils beste System für ihre Bedürfnisse wählen. Ein “Design Pattern” ist eine wiederverwendbare Lösung, die ähnliche Softwaredesign-Probleme elegant löst. Sie benötigen Schablonen names “Interfaces” in den Programmiersprachen, die öffentliche Klassenmethoden und ihre Signaturen erzwingen können. Die wichtigste Anforderung sind unabhängige Bausteine ohne Seiteneffekte, die zu Komponenten zusammen gefügt werden können. Ein oder mehrere Bausteine sind für die Funktionalität einer Fachdomäne zuständig. 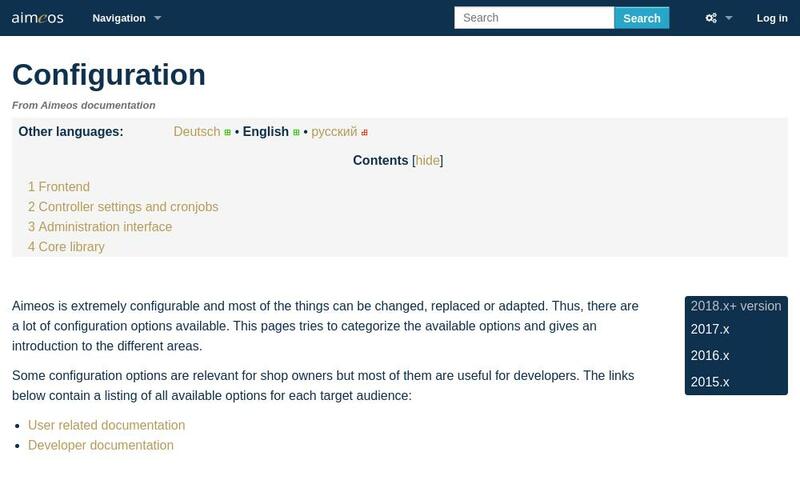 Eine Domäne kann eine HTML Oberfläche, eine JSON REST API oder eine Administrationsoberfläche sein. Die vertikale Trennung von Code in Fachdomänen ermöglicht es Applikationen beliebig zu skalieren, indem sie als Microservices auf mehreren Serverinstanzen laufen können. 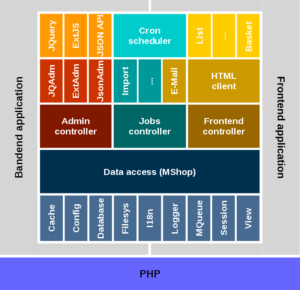 Microservices sind lose gekoppelte Applikationen, die ihre Dienste über leichtgewichtige Protokolle wie HTTP oder JSON anbieten. Sie sind leichter zu erweitern, zu warten und auszurollen als monolithische Applikationen.